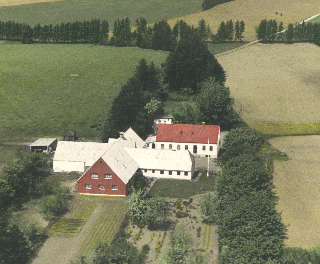 I was born in 1949 at Hejnsvig near Billund in central Jutland, western Denmark. Raised on a farm with 30 hectares of land, cattle, pigs, hens and ducks. I have 3 brothers and one sister. My grandparents were early Christian missionaries in Nigeria from 1913 to 1949, and the life of our family was, in many ways, influenced by Christian faith. 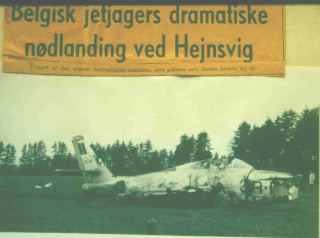 In june 1957, when I was 7 years of age, a fantastic event crashed into my life: A Republic F84F jet-fighter plane from the Royal Belgium Air Force crash landed at my fathers farm, and ended up only 35 meters from the windows of my mothers kitchen. The pilot survived with only small injuries. The following week - until the plane was transported away - was like a fairy-tale for me. After that, I began building model aero planes out of cardboard and "japan paper". The pilot was able to open the hood and get out. At the age of 12 - together with other boys in the village I started a model aero plane club. After some years we arranged nationwide contests for "free flight" model aero planes. (Before "Radio Control" was common).Later I participated in Danish national championships and also Nordic Countries championships once. I developed my own design, and ordered my first copy of "Theory Of Wing Sections" from Dover Publications, New York, when I was 15. Erik with a rubber powered "Wakefield" model. In 1969 I moved to Copenhagen to study for an engineer at the Polytechnical Highschool. ( Now Danish Technical University). At the polytechnic flying group I learned flying a glider plane, and I stopped building model airplanes. The flying group was an enthusiastic aeronautic environment. Both gliders and motor planes were designed and built by teachers and students of the Polytechnic Highschool. And most of us were very interested in aeronautics and planes. K8 Glider plane at polytechnic flying group airfield. In 1971 I joined the "ecology group" at the Technical Highschool - We acquired knowledge on ecological questions and discussed how we could help develop a more sustainable life on the planet. The students clerk, Jens Brøndum, was a great inspiration to me. At the roof of our house in Lyngby I built and mounted a solar hot water collector in 1971 . In the basement I built a waterless toilet. 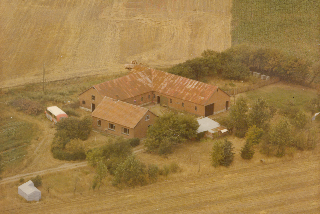 In 1973 I stopped halfway - studying for an engineer; determined to move back to western Denmark to make experiments with new ways of living and production. Together with my coming wife, Tove we bought a small farm - grew our own food and tried to start up a production of glued together aluminum solar water heaters. In the following years we volunteered in an organization called NOAH ( Similar to Friends of the Earth) See next period.